Healthcare currently is in a state of flux as providers strive to navigate a payment and incentive shift with the focus moving from volume to high-quality care delivery. Relative costs are rising while quality measures—including beneficiary satisfaction and clinical outcomes—are becoming more crucial to payers and embedded in payment calculations. Meanwhile, the healthcare industry is witnessing the ongoing expansion of accountable care organizations (ACOs) as vehicles to accomplish this transformation. Amid the high expectations for ACOs, however, it is important to keep in mind that delivering value-based care requires much more than forming and labeling an entity an ACO. An ACO should be perceived as being more than just a model for shared savings: In the broadest sense, it also should be seen as a structure to facilitate hospital-physician-payer alignment. Realizing this potential of ACOs, however, necessitates an organizational shift and clinical transformation bolstered by physician engagement. ACOs face many obstacles along the way, with two challenges in particular being to negotiate fair value-based payment rates with payers and to address the misalignment of financial incentives. Clinical integration is a critical component in overcoming these hurdles and enables the provision of high-quality, affordable care through an ACO model. These two lists are correlated, in that the more an ACO can develop its eight core capabilities, the more prepared its operating infrastructure will be to bear risk. If an ACO is considering moving from a low-risk model, such as one-sided shared savings, to a high-risk model, such as global payment, it will need to have a strong base in all eight competencies. The majority of ACOs arise in a time when their physician participants operate under an outdated compensation model in which the providers have incentives to maximize volume and productivity. These models often do not take into account high cost drivers such as hospital readmissions, infection rates, and length of stay. Physicians are unlikely to change their practice and referral patterns unless they have clear incentives to appropriately use clinical resources to eliminate unnecessary care and reduce divergence from evidence-based best practices. For example, rewarding physicians for having high numbers of patients schedule and attend follow-up appointments after major clinical procedures has been an effective incentive strategy to lower readmission rates and, in turn, decrease total cost of care associated with these procedures. The Centers for Medicare & Medicaid Services supports the concepts of both increased quality of care and cost prevention and has established a number of programs aimed at achieving these outcomes. Many of the Medicare Shared Savings Program’s 33 ACO core quality measures involve screening, health education, and other preventive objectives. However, these measures are not enough to alter deep-rooted provider behavior and significantly affect patient outcomes. For an ACO to be sustainable in the long-term, it must develop and implement a multiyear plan both internally and with its commercial payer partners through innovative contracting arrangements that ease into greater risk sharing as data exchange and care models are developed. The long-term organizational plan to align ACO goals with physician incentive compensation should be based on an annual ramp-up in terms of percentage of income paid out relative to performance on quality measures over productivity measures. Meanwhile, the organization’s payer strategy should focus consistently and increasingly on delivering and being rewarded for value-based care. Any advanced contracting strategy that positions the ACO in partially or fully capitated arrangements will require a focus and commitment to fully develop the core business competencies within each of the eight domains of service. Such efforts will afford the ACO the flexibility to shift its resources and incentives from an outdated volume based care model to a progressive value based care model. Mr. Heckhausen is an analyst with GE Healthcare Camden Group, specializing in finance. Mr. Heckhausen's expertise includes fair market valuations, co-management agreements, hospital/physician group acquisitions and partnerships, bundled payment projects, and other financial/strategic advising initiatives. He may be reached at Maximilian.Heckhausen@ge.com. MSSP Year 1 Results – New Surprises or Business as Usual? While a fair amount of bashing and fear mongering have occurred with the release of the MSSP Year 1 Results, there are other important factors to consider. Change is uncomfortable. The healthcare industry and the landscape/structures for successful change are just beginning to form. Change is not a regular occurrence in the industry nor is it filled with early adopters/risk takers. For example, today there are dozens of articles discussing how EHRs should be put out to pasture because they are difficult to use, a waste of time, and—as many pointed out after the first U.S. Ebola case—detrimental to patient care. EHRs (and the data they are capable of providing to support sound decisions) are key components to the changes that must be made. At the heart of the Medicare Shared Savings Program is a fundamental change in the way healthcare is conducted and measured. Make no mistake; there aren’t any tried and true recipes for success; however there are some key indicators that are emerging. Two of these are care coordination and analysis of clinical and claims data to understand the entire population and also drill down to understand the individual patient. Without these, the MSSP ACOs in particular, will be hard-pressed to reach shared savings. Certainly some of them can have early wins based upon their experience with other risk programs because they are a small, close knit group who have great relationships with local hospitals, etc. However, the key to taking the next step to continue to find savings will be analytics and care coordination. Much to the dismay of some organizations, this isn’t an exercise where money is handed out for doing nothing. This program was built to incentivize the changes that are needed to move toward value-based care and population health and, frankly, as a learning center. The first-year performance exemplifies this point. About a quarter (25%) of the 2012 and 2013 ACOs were successful at generating and earning savings from which about 40% of those were ACOs launched in 2013. Ultimately, as an industry, we need to learn to measure success from a different angle. While financial windfalls are certainly at the top of the list of how to measure success, when dealing with the large scale changes that are needed to right this ship, there are many other factors that must be utilized to understand success. Much has been learned along the way, and there is much more to learn. 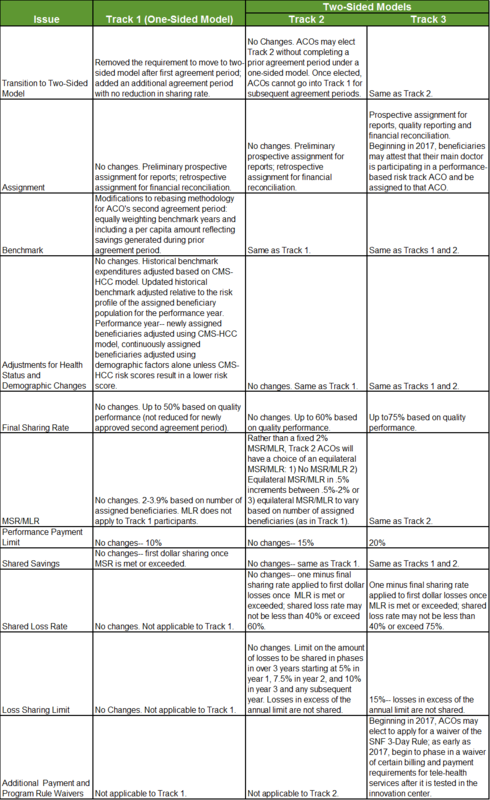 All healthcare silos are still learning how and what to measure for quality, how that relates to “performance,” how to best utilize and connect the data points, etc. All of the HIT push from the past 10 years has set the stage for the incremental wins that are now occurring. It is now up to all of us to continue connecting the dots and helping retrain and retool the way healthcare is viewed and is conducted. As a member of the Health Directions Population Health Management Solutions Group, Mishka leads the implementation of clinical integration, accountable care and other innovation strategies for the firm’s clients. Her in-depth knowledge of value-based care operations provides the context for assisting clients in navigating the population health journey. Prior to joining Health Directions, Mishka served as the Director of Implementation Services for Collaborative Health Systems in Houston, Texas, working with over 30 Medicare Shared Savings Program Accountable Care Organizations across the US. Mishka may be reached by email at mglaser@healthdirections.com. An accountable care organization formed by Anthem Blue Cross and Torrance, Calif.-based HealthCare Partners produced $4.7 million in savings for the first six months of 2013 compared with a similar patient pool, the organizations say. reduced laboratory and radiology tests. In addition, the ACO improved quality measures in preventive health screenings and the management of acute and chronic disease as measured by HEDIS. HealthCare Partners established an ACO unit in late 2012 with a dedicated staff of care managers and care coordinators who identify hospitalized ACO patients, coordinate transitions of care, and ensure patient care and healthcare resources are accessible. In addition, HealthCare Partners extended medical management programs to Anthem ACO patients, such as disease management, special care for high-risk patients, home care and palliative care programs. As a HD Insights Blog reader, you are used to seeing us share helpful and engaging infographics on a regular basis. We share these infographics because we hope that they can help you better explain a multitude of topics to your patients, colleagues, and constituents. We hope that you find these infographics worthwhile. If there is an infographic that you would like to share with our blog readership, please email a link or .jpg, .png, or .tif file to msmith@healthdirections.com We will be happy to review the infographic and share it if we feel it is appropriate for the readership. **For a full-sized look at the infographic, please click here and then click on the image to enlarge. The accountable care organization (ACO) movement continues to heat up. In fact, looking ahead, there is a greater number of ACOs in the wings than one year ago. Forty-four percent of developing ACOs will be helmed by physician-hospital organizations, according to a new infographic from the Healthcare Intelligence Network. This HINfographic examines 12 emerging ACO trends at 138 healthcare organizations and delivers tactics from a top performing Pioneer ACO, Monarch HealthCare. eClinicalWorks, a leader in ambulatory healthcare IT solutions, was named the most used system across Accountable Care Organization (ACO) functional categories among both electronic health record (EHR) and third-party vendors in a recent KLAS survey. KLAS, a research firm that rates healthcare technology to help providers make informed decisions, published the report in response to an increasing amount of physician-led ACOs. The report, titled “Physician ACOs 2014: Variations on the Accountable Care Theme,” surveyed nearly 50 ACO organizations to better understand physician-led ACOs and their supporting vendors. eClinicalWorks CCMR provides organizations visibility into a patient’s care across all settings, facilitate smooth transitions of care, engage patients and providers in preventative care, improve outcomes among populations and reduce costs. A vendor-neutral, open network securely connects ambulatory EHRs with hospital in-patient systems and payer claim feeds, including CMS, to provide cost and utilization for services delivered to patients.